Found 2 file extension associations related to LexNavigator and 2 file formats developed specifically for use with LexNavigator. Including all the legislation of 1818 so far, with several unique modules in content and as a technical achievement, LexNavigator is the source informed legislative available today. Unifying experience and knowledge of attorneys, lawyers and economists with expertise in software efficiency, LexNavigator is the solution you need to master the Romanian legislation. Save time, money and effort and focus on your business essentials. Use this employee now smart, hardworking and loyal. 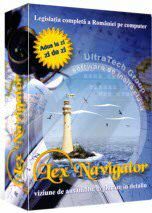 If you need more information please contact the developers of LexNavigator (UltraTech Group), or check out their product website.